By law almost all videos and DVDs have to be classified by the British Board of Film Classification (BBFC) before they can be made available. It is prohibited to supply videos to children and young persons under classification age - 12, 15, or 18. 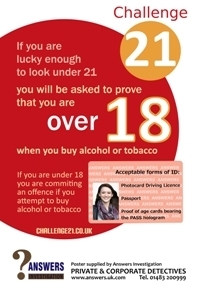 The maximum fine for the offences is £20,000 and/or up to 2 years imprisonment. Trading Standards departments frequently run test-purchase campaigns with on-the-spot and retailer fines becoming prevalent. A due diligence exercise using our "under-age" purchasers demonstrates an awareness of the problem and willingness to take action to evaluate training and impementation of retailer policy on the shop floor. 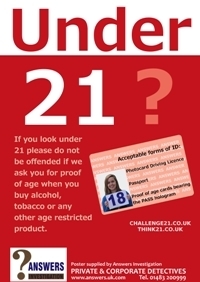 Telephone 0871 246 2750 * or email info@think21.co.uk. Talk to us - before Trading Standards talk to you?